These apartment-style non-smoking suites have two bedrooms, two full baths, a living room, dining room and kitchen. The master bedroom has a king bed with a luxurious custom pillow top mattress, private bath, 32-inch flat panel HDTV and walk-in closet. The second bedroom has two full beds also with pillow top mattresses, 32-inch flat panel HDTV and a hall bath just outside the bedroom. The living room has a sleeper sofa, two chairs and a 32-inch flat panel HDTV. The dining room has a table and six chairs. The kitchen has granite countertops, dishwasher, full size appliances, dishes, glassware, silverware and a coffeemaker. Upstairs units have a balcony; downstairs units have a porch and fenced backyard. 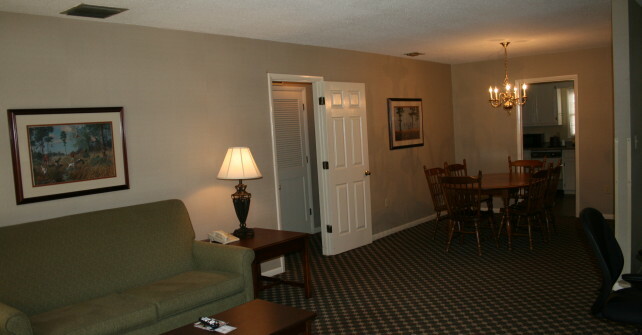 Complimentary ultra-fast wireless internet is available throughout the suite.